The Lutheran church has always been known for its rich heritage of sacred music and hymnody. Most Scandinavian Lutherans with any familiarity of hymns have heard the name Lina Sandell but may be unacquainted with other female hymn writers included in the recent publication, Preaching from Home. 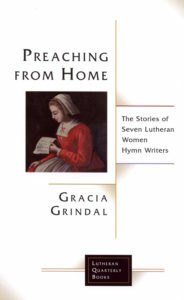 Lutheran Quarterly and author Gracia Grindal have made a significant contribution to the Lutheran church with this unique, scholarly volume. From the author’s perspective, “This is a modest attempt to convey to Americans something of the treasures in which I have immersed myself over the past forty years.” But the reader will quickly see that it is far more, as the author shows herself to be not only a competent translator and hymn writer but also a fine historian and Scandinavian scholar. The extensive research required to complete this work is mind-boggling to consider. This “taste” of Scandinavian Lutheran hymnody by women spans four centuries and illustrates how each succeeding hymn writer was and is, though sometimes unknowingly, influenced by writers of past generations. The author also notes an interesting connection of the selected hymn writers to the Lutheran parsonage, where many of them grew up and absorbed rich spiritual truths. The opening chapter introduces Elisabeth Cruciger, who was perhaps Martin Luther’s first student of hymn writing. The chapters that follow include biographies of six other women hymn writers — two each from Denmark, Norway, and Sweden. 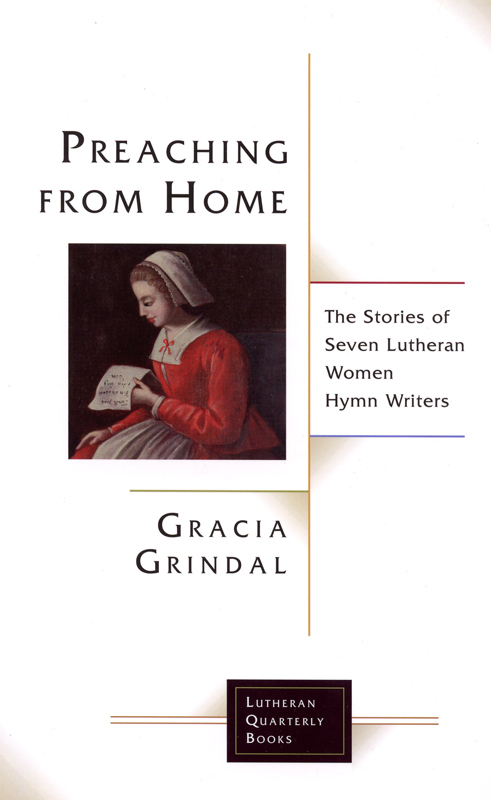 The final chapter notes their influence on Grindal’s own work as an American Lutheran woman hymn writer. The title idea of “preaching from home” is woven into every chapter as the author explains how each woman, regardless of her specific vocation, “preached” the Word of God through the hymns she wrote. Norway’s first published woman poet and early hymn writer Dorothe Engelbretsdatter “understood herself to be a proclaimer of the Word, if not in church, at least at home in the daily round of devotions and hymn singing.” Tracing this concept to the hymns of Martin Luther, Grindal notes a letter Luther wrote to his friend Spalatin stating that he intended to make “spiritual songs so that the Word of God even by means of song may live among the people.” Luther wanted worship services in the language of the people so they could understand the Bible and faith in Christ. He wanted his hymns, in a sense, to be the Word of God, preached to the congregation by those singing it to each other. The English tradition of hymnody through Calvin, Watts, and the Wesleys is rooted in biblical paraphrases. But Luther’s hymns, Grindal emphasizes, were proclamation of scripture, gospel-centered, pointing to Christ. The author’s background is not unlike this reviewer’s North Dakotan Lutheran Free Church roots. The numerous connections of the hymn writers to Lutheran Pietists, who emphasized living faith, was therefore fascinating. The hymns of Dorothe Engelbretsdatter in Norway clearly reflected the writings of Johan Arndt and his True Christianity. Birgitte Boye was likely instructed in the Christian faith through use of Pontoppidan’s Explanation as well as the great Danish hymns of Thomas Kingo and Hans Adolph Brorson. The chapter on Berthe Aarflot includes extended biographical information on the Norwegian lay evangelist Hans Nielsen Hauge and explains how he influenced her writings. Lina Sandell, whose hymns clearly display an intimate relationship with God, is well-known in Midwest Lutheranism for her Swedish hymns “Children of the Heavenly Father” and “Day by Day.” Sandell was friends with lay theologian C. O. Rosenius and was also influenced by Moravian Nicholas von Zinzendorf. The title idea of “preaching from home” is woven into every chapter as the author explains how each woman, regardless of her specific vocation, “preached” the Word of God through the hymns she wrote. All of these hymn writers were industrious and capable, yet few of their songs survived across the ocean. Many of the writers and their hymns have all but fallen into oblivion even in their own countries. As hymn books were being compiled centuries ago, perhaps circumstances of the day, or at times even gender, may have caused these hymns to somehow be overlooked. Wooden translations and a resistance to the Scandinavian modal tunes may also have prevented some hymns from entering the new world. Yet certainly they proclaimed the Word of God, and perhaps we may be fortunate enough to rediscover some hidden gems. Today hymn writers face other challenges. Until the last century, one could assume that most people had a general knowledge of scripture. But Britt Hallqvist (Sweden) and Lisbeth Andersen (Denmark), whom the author had occasion to personally interact with, learned that their 20th century hymns needed to speak to many who were biblically illiterate and did not understand theological concepts. Grindal’s final chapter gives us a glimpse of hymn writing from a different perspective. Readers get inside the process. From her first attempts at hymn writing, to how translating hymns helped give her a sense for writing them, to work on a hymnal committee, and other challenges, Grindal shows how her understanding of hymnody and hymn writing developed over time. Anyone with an appreciation for history or hymnody will welcome this book, but modern hymn writers will be inspired to continue crafting hymns that preach the Word of God and point to Christ. Marian Christopherson is parish education director for Ambassador Publications, the publishing arm of the Association of Free Lutheran Congregations, Plymouth, Minnesota.